It's fairly easy to agree on the desirability of shifting our energy diet away from fossil fuels and toward more renewable or sustainable sources, but it's much harder to agree on the time scale involved. While recognizing the great potential of renewable energy technologies such as wind, solar and geothermal power, along with advanced, non-food-based biofuels, I am convinced that the transition will take much longer than many hope--longer than many will have patience for, in light of pressing concerns about energy security and the environment. When considering future shifts in our energy diet, it's instructive to review some of the changes we've already experienced, and how long they took. 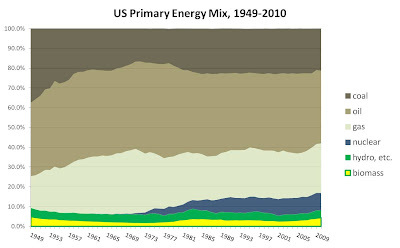 The graph below displays the relative contribution of America's main energy sources since 1949, based on data from the Energy Information Agency of the US Department of Energy. This chart, which compares the proportional, rather than absolute contribution of each source as a percent of the total, shows that the US energy diet has experienced constant change over the last seven decades. Some of these changes have been dramatic, such as the erosion of coal's market share in the 1950s and '60s by oil and natural gas, while others, such as the resurgence of biomass-based energy since the 1970s are less dramatic but still noticeable. On the scale of this graph the non-biomass renewables that I've lumped together appear relatively steady, because the recent rapid growth of wind and solar energy has so far only compensated for a contemporaneous decline in hydropower output. I'd expect the growth of that green segment to be more obvious in a few years, though still not on the scale of nuclear power. The chart also reminds us that however prominent a given energy source might have become during this period, none overwhelmed the others. We talk a great deal about oil's dominance, yet it never exceeded a 48% share of our energy diet, and it has recently fallen below 37%. In fact, you'd have to go all the way back to the 1920s to find an energy source with a market share above 60%, which coal still enjoyed during the early years of oil's rise as the combination of mass-produced cars and the big oil finds in East Texas and Oklahoma upended the US energy landscape. That's one reason I generally find forecasts of renewables capturing 80% of the energy market within a few decades to be improbable. Perhaps the most relevant example for renewables of a disruptive energy technology capturing a significant share of the market is commercial nuclear power, which contributed just 0.1% of US energy in 1962. That's about what solar provides today. Yet even with a major push by utilities and government and broadly favorable market acceptance until after the Three Mile Island accident, it still took nuclear power 25 years to reach a 6% share of total US primary energy, and nearly 40 years to reach its current 8% or so. Today's renewables also face similar limits on their potential market penetration, albeit due to very different factors relating to intermittency and the high cost of energy storage. What would it take for renewables to repeat the model of oil's success against coal? In the absence of a high carbon price or incentives on a level unlikely to be either politically feasible or affordable in the current environment, I believe it would require technologies that don't just reduce greenhouse gas emissions or local pollutants, but actually enable something new and very attractive to consumers and businesses, along the lines of the quantum leaps in mobility and other economic activity that oil made possible. Otherwise, their promoters should be prepared to play a long game, in much the same way that the conventional energy industry did when it was building its market post World War II. Do investors and policy makers have the patience that requires? By the way The Energy Collective is offering a free virtual conference on November 30 on the subject of "How to Save A Planet on A Budget." The conference includes panel discussions and case studies moderated by Marc Gunther of Fortune magazine, Jesse Jenkins of the Breakthrough Institute, and Gernot Wagner, economist at the Environmental Defense Fund. To register click here. I'd also like to wish my US readers a pleasant Thanksgiving weekend.